On the occasion of European Immunization Week 2017, Dr Zsuzsanna Jakab, WHO Regional Director for Europe, visited Romania on 27–28 April to provide high-level support to national efforts to control the largest measles outbreak recorded in recent years in the country. The outbreak in Romania began in January 2016 and is currently among several in the WHO European Region that together threaten the Region’s progress towards elimination of the disease. 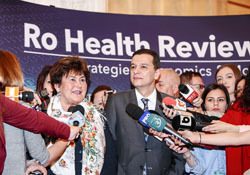 The main event during Dr Jakab’s visit was a policy dialogue on immunization, entitled “Vaccination: A Public Health Issue”, organized on 27 April at the Palace of Parliament by the Romanian Ministry of Health, health committees of the Senate and Chamber of Deputies and the WHO Country Office in Romania. The event brought together politicians, specialists, family doctors, representatives of the Presidential Administration and academia to highlight the urgent need to increase immunization coverage in the country, improve the vaccine supply system and control the current measles outbreak. Presenting the European Vaccine Action Plan goals, including Regional elimination of measles and rubella, Dr Jakab said, “I am pleased we have this opportunity to discuss our joint health priorities and am heartened by your commitment to immunization as evidenced by our presence here today. Measles and rubella can be eliminated in Romania. There is no lack of means, tools or strategies to ensure that Romania joins the growing list of countries that have crossed the line to elimination. What we need to move forward is government leadership and engagement of health professionals, communities, parents, media and other important players”. The ongoing outbreak in Romania has spread across the country since January 2016, affecting people of all ages and causing over 4800 cases, including 23 deaths as of 28 April 2017. The highest burden has fallen on children, including 888 infants too young to be vaccinated. Of all cases, 96.6% were not vaccinated. Today, Romania is facing critical vaccine shortages or delays, including of the measles, mumps and rubella (MMR) vaccine, along with a substantial drop in immunization coverage. At the policy dialogue event, Prime Minister Sorin Grindeanu, spoke of the government’s commitment to resolve the current vaccine supply shortage and ensure predictability, flexibility and continuity of supply in the future: “It’s a situation that can no longer be tolerated or accepted. It’s inadmissible for multiple vaccine shortage crises to occur in Romania each year. This situation has caused suffering to those families whose children died of measles. There are no excuses for these tragedies, nor for the fact that for certain vaccines only 1 in 2 children are immunized”. build a national stock of vaccines for exceptional situations. In early April 2017, the Ministry of Health introduced a new law on vaccination for public debate, which would make vaccination mandatory for kindergarten or school enrollment. “We are open to dialogue and determined to work together to adopt the necessary legislative changes, adapting our legislation to the problems and conditions of our society,” stressed Dr Laszlo Attila, head of the Public Health Committee of the Senate of Romania during the policy dialogue on immunization. Within the framework of European Immunization Week 2017, the Regional Director also met with the Romanian President Klaus Iohannis. Their discussion focused on immunization issues in the context of the 2030 Agenda for Sustainable Development and the Sustainable Development Goals (SDGs). President Iohannis underlined the involvement of the Presidential Administration in the comprehensive National Health Prevention and Education Project, which is in line with SDG 3 on ensuring health and well-being. President Iohannis applauded recent collaboration between Romania and WHO, including in the areas of human resources for health and health in environmental policies. key to ensuring vaccination takes place safely and according to the national schedule. The availability of vaccines, parents’ engagement, and mobility of individuals and families were also addressed in the meeting. “Everyone has a role to play: the system works when the entire society is committed to immunization. And family doctors are a critical pillar of this system,” concluded Dr Jakab. Since last year, WHO has provided extensive support to Romania to control the measles outbreak. A number of missions to the country have been conducted for outbreak response communications, vaccination strategy and advocacy. The next meeting of the Regional Verification Commission for Measles and Rubella Elimination (RVC) – the independent body that evaluates countries’ performance towards elimination of these two diseases – will take place in Bucharest on 15–17 June 2017. With support from the WHO Regional Office for Europe and the Country Office in Romania, a study involving families affected by the recent outbreak will be conducted to better understand the barriers to vaccination.